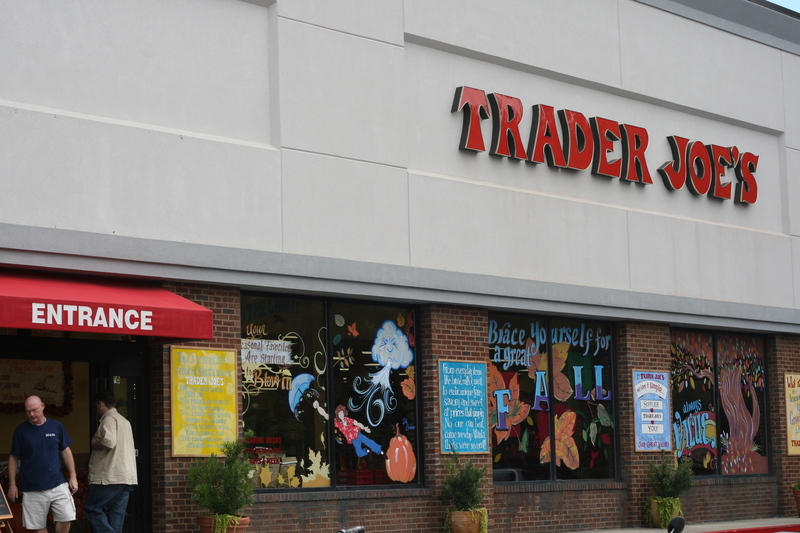 Trader Joe’s always seemed so American to me: from the plentiful free samples, to the friendly and knowledgeable staff (who actually appear happy to be working there) to the free stickers and lollipops for kids. So I was surprised to read that it is actually owned by German supermarket kingpins. Even though it’s a chain, Trader Joe’s comes across as a quirky neighborhood shop, thanks to the Hawaiin shirts the employees wear, and the unique items on offer (pumpkin pancakes and low-fat chocolate yogurt come to mind). I am now eager to take a trip to Germany to visit some other shops owned by the Albrecht family. I can only hope that free lollipops are the international norm. One luxury I have missed about the US is the grocery store bag help. In the UK, shoppers have to put their own groceries into bags. I discovered this fact during an embarrassing incident in Tesco, Britain’s largest retailer. The cashier and I smiled politely at each other, staring at the products I had just paid for, wondering why no one was putting them into bags. For months, I struggled to empty the cart, take out my wallet, pay, then pile it all into bags — often while the shopper behind me was pushing their things onto the scanner. After a few years, though, I became adept enough at shopping multi-tasking that I started texting while emptying, packing and paying. This once led to the smashing of a jar of salsa on the tile floor of a Tesco Metro. The store employees were incredibly efficient in cleaning it. I was incredibly apologetic. In our local grocery stores here in the US, like Trader Joe’s, I stand and watch while cheery workers whisk our goods into bags. I feel silly, standing there, while they work so hard, and I try to help — but they shoo me away. I want to explain that in my grocery glory days, I was able to unpack, pay, and bag, while texting — (sometimes) without dropping anything. But they don’t need my help. Often, there are two folks at check-out, making me feel even more like a spare part – a drone that simply pushes a cart. Here we are, in early November, and it’s a day more beautiful than any I can remember in London. It’s sunny, warm, but not too hot, with a light, crisp breeze. During a trip to Trader Joe’s, I ran into a fellow preschool mom wearing shorts. While living in London, I only wore shorts to the gym. The weather was rarely good enough to expose legs. Atlantans don’t know how good they have it.